And to make it easy to carry all the important tools that you need for the job, you need to have the best electrician tool belt. 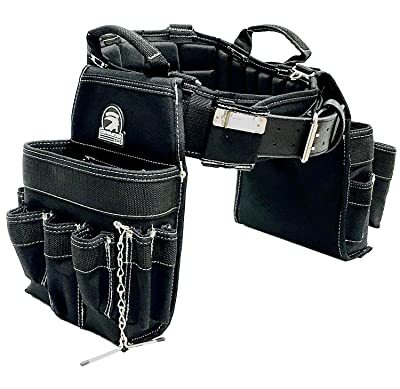 A good electrician tool belt will be designed to provide enough room for all your tools and the pouches are designed to fit specific electrician tools. With a tool belt, you can also work in almost any environment whether it is on the ground or you have to climb. And because electrician tools can be quite pricey, these tool belts also help to decrease the likelihood of losing some in the work site or leaving them behind. But, given the fact that this is a very common profession, you can be sure that there is a high demand for these tool belts, and so there are various types and models in the market. Hence, to make sure that you end up with something top quality and useful, you need to have the right information. This piece provides the important information you need when picking your tool belt with top 7 electrician tool belt reviews and by explaining the crucial elements to consider when shopping. Gatorback is one of the most famous tool belt manufacturers, and their products are some of the most widely used. And with such a reputation you can be confident that their model B240 electrician tool belt is a top quality product even before you use. The tool belt features a rugged and durable 1250 DuraTek nylon construction which also helps to make it lightweight, and its stress points are riveted and with bar-tacked stitching for extra strength. This tool belt has two pouches with one larger one having 18 pockets and a smaller 9-pocket one. Also, the pockets come with a plastic lining designed to give them a box shape for easy access and to ensure they never sag. Also, this is a super comfortable tool belt thanks to the ventilated padding that enhances breathability and comfort. The design of this tool belt and other things like its shape and size are all engineered to suit the needs of an electrician. And to make it even more convenient, it also includes some carry handles for convenient transportation and also to make it easier to wear and remove. TradeGear partners with Gatorback to make this electrician tool belt, and so you can rightfully expect it to be top notch quality. One of its key highlights is the 1250 DuraTek nylon material that not only makes it lightweight but also ensures that it will be a rugged tool belt that can withstand any job site condition. 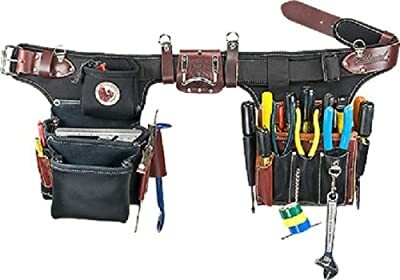 There are also two pouches on this tool belt which provide a total of 27 pockets that come in different sizes to make the tool belt versatile as it can accommodate different tool types and sizes. Also, like many other top quality tool belts, this belt has the stress points reinforced with bar tacked stitching and metal rivets. There is also ventilated foam padding on the belt with some unique air channels and it will help to keep you dry and comfortable. And it will combine with the contoured back support to make this an even more comfortable tool belt. To make sure that you can wear and remove it quickly and that it will be easy to carry it to and from the work site, the manufacturer also includes some convenient carry handles. A more complete Gatorback electrician tool belt package like this one that also comes with other things like gloves, suspenders and drill holster will be more convenient. Also, it saves you some cash as you will not need to spend money buying any of these things separately. But, the best thing about it is that it also features a tough 1250 DuraTek nylon material that makes it tough and durable. With the reinforced stress points that feature metal rivets and bar tacked stitching, this will even be a more durable tool belt that will serve you for many years. Comfort is also guaranteed as it has ventilated padding with air channels and contoured back support. The availability of 6 different sizes also ensures more comfort as you can easily get something that fits you perfectly. 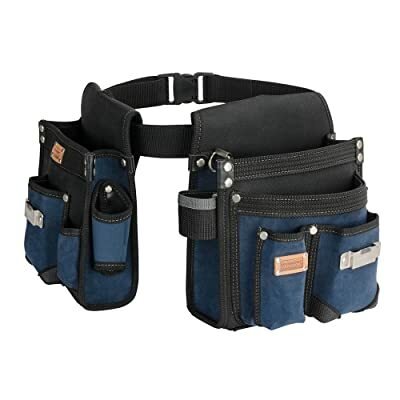 Other things that make this the best electrician tool belt for the money is the fact that all the pouches and pockets are specifically made for an electrician and that it also includes some convenient carry handles. Sometimes you just want a cheap electrician tool belt that does the job well enough and with a decent lifespan. When that is the case for you, this Marksign product will be a perfect choice. Despite being one of the cheapest electrician tool belts out there, it is still a quite heavy duty and with multiple tool pockets for different tools. The pockets are all designed to be wide, deep and easy to access so that taking out and returning tools will always be a quick and effortless task for electricians. Like other tool belts that cost several times its price tag, this belt also has reinforced stitching on the stress points which helps to make it even sturdier and more durable. With the easily adjustable buckle design on the 1.5-inch nylon belt, you can adjust the size to ensure a more custom and comfortable fit. The Occidental Leather 9596 tool belt might cost more than the average ones but given the quality of the construction and the material, it is worth every buck and even more as it will give you great service for many years. And with this tool belt, you can always be sure of the security of the tools and your safety as no tool will rip through the pockets. 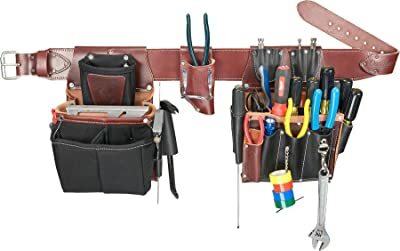 Being a leather product, this tool belt will not need a replacement for a long time, and it is also handcrafted to give it a more authentic and unique look to ensure it also looks good on you. With this tool belt, each of the many pockets or tool holders are designed to conform to the shape of the tool which keeps it more secure. This is also a hand-specific tool belt to make it easier to use as you will be using something meant for your specific hand orientation. And you can also adjust the fit to ensure it will be more comfortable around your waist. 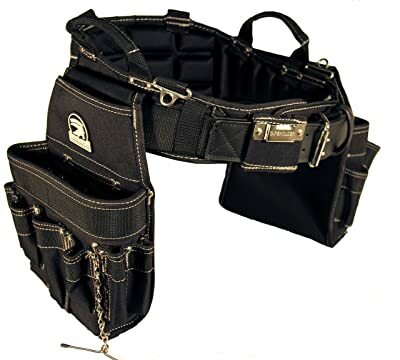 Its 6-layer construction and rivet reinforcement help to make it a tough and rugged tool belt that can withstand regular abuse and use in almost any work environment. Also, its many pockets are designed to ensure they will never sag and to be wide enough for easy tool access and hidden seam construction for a more appealing finish. The tool belt is designed to fit waists 32-48 inches which is where the majority of adults fall, and with a sufficiently padded belt for extra comfort and a heavy-duty buckle that makes it easy to customize the fit. When compared to others out there, this is also a more affordable tool belt, and so you will be getting great quality at a bargain. With a genuine leather tool belt like this one by Occidental Leather, you will not have to think about buying a new tool belt for many years as it is designed to offer great and long lasting service. The company only uses genuine leather and the belt is handmade to give it a more appealing and authentic look that will impress any electrician. You will also never have to leave any important tool behind when using it as it is designed with several electrician-specific pockets for all your tools. And it is a hand specific model for ease of use and to make it easier to master the location of all tools. Another element of this tool belt that any electrician will love is that it has no-spill tool holding system that will prevent tools from falling out. Also, the belt is available in several sizes to make it easy to get something that fits snugly. With the many types of electrician tool belts out there, picking just one can be a hectic and overwhelming task. And this is more so because all look good enough and their manufacturers market them as the best. However, to ensure that you end up with something that will serve you well, it is important to consider the following things when shopping. Design of the tool belt is the first thing that you will always notice, and so it is one of the first things that you will need to consider when choosing one. However, the design is a broad term that encompasses various things that you need to take into account. First, when it comes to the tool belt design, you need to decide whether to go for a rig or apron as both are quite handy for carrying tools. However, each has merits and demerits. 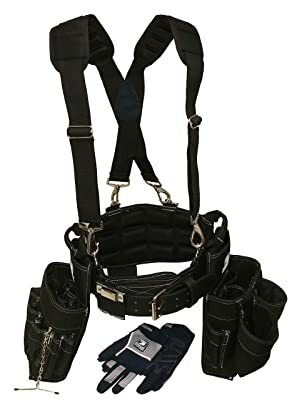 A rig is a very tough work belt designed to buckle at the front and with added pouches and loops that can be removed for use separately or moved around for customization. The modular design makes rigs more versatile and the separate pouches are typically larger for extra storage space. Tool rigs also have better back support and padding, and a suspension system for extra support but they are generally pricier. Aprons are also based on a work belt, but like a domestic apron, they are meant for wearing at the front and with side buckling. Also, unlike the rig, they have some permanently fixed pouches and riveted pockets. And they are also not hand-specific like some rig types as the storage on both sides is often symmetrical. An apron is a much better option than a rig if the job will require you to have a few tools very close at hand. And they will provide a more cost-effective alternative to the rig belts which makes them quite popular with DIYers and tradesmen. Many aprons will come with quick release buckles for easy removing, and they are generally lighter. However, they are not the best option if you want something to carry larger and heavier tools. Besides choosing between rig and apron tool belt designs, you will also need to decide whether to go for something with straps or the strapless types. Strapped belts are the best for carrying heavy tools as they distribute weight more evenly across the body and will be perfect for those with back pain. Strapless belts, on the other hand, are more affordable and are a great choice if you want something quick and easy to wear and remove for carrying smaller size and lightweight tools. Still, on the design, you will need to consider other things like the color, shape and also whether the belt is meant for heavy or light duties. Also, a good tool belt design should include efficient moisture and sweat-wicking lining to keep you dry and comfortable. The next important thing to consider when choosing a tool belt is the material used to make it. And although different manufacturers will use different materials, leather, nylon, and polyester are by far the most popular options. Leather is the toughest and also priciest tool belt material, and it is available in three common variations which are soft, bonded and thick leather. The quality of these leathers and their feel will differ, and they also come in different price ranges. But, generally leather makes the most comfortable and durable tool belts, and it is also more effective in preventing piercing by sharp edges and points. However, leather electrician tool belts are some of the priciest and are not always weatherproof. Nylon is an artificial material that makes some more affordable tool belts, and it is also a more lightweight material to ensure it does not weigh you down. With a nylon belt, you also get more water resistance than you would with a leather one, and it is also more resistant to scratches. However, nylon is not very good at absorbing sweat and also not as tough and durable as leather. Polyester is a synthetic tool belt material that is quite similar to nylon. It helps to make the tool belt more lightweight, and like nylon, it is also more affordable than leather. Also, polyester is one of the most water resistant tool belt materials. The most significant shortcoming of polyester is that it is the least durable material of the three, and so you should not expect to get many years of service from a polyester tool belt. How many tools do you want to carry on your tool belt? What is the size of your largest and smallest tools? When it comes to deciding on the compartments, you will need to answer these questions and choose the appropriate tool belt based on the answers. However, the more the compartments the better the tool belt will be because at some point you might need to do a job that requires you to carry extra tools. Still, at the compartments, you need to consider how much time it takes to break them in or at least make them easy and comfortable to use. Leather pockets and pouches take longer to break in than nylon and polyester ones but they are also the most durable ones. Do you prefer a one size fits all tool belt that you can share with others or one that comes in your specific size? Waist size is a crucial element to take into account when choosing an electrician tool belt as it will determine how comfortable it will be to wear. Many tool belts will come in an adjustable waist size range (for example, 29-46 inches) to ensure that they can fit most electricians. But, to make sure that you get the perfect fit, make sure that the belt is easily adjustable to give you a snug fit. A snug fitting belt that is not overly tight will not only be more comfortable but will not sag under the weight of the tools. Like with everything else, the price of the tool belt matters a lot. And it is important to note that the priciest tool belts are not always the best quality. Hence, a wise idea should always be to try and find the best quality tool belt within your budget. While your tools are vital for your work, they can also pose some danger to you, and so it is always important to take precautions even when keeping them in a tool belt. There are many things you can do to ensure this, and here are some safety tips to help you out. The first tip and probably the most important one is to organize the tools in the belt properly. And you should start by making sure that the pouches and pockets are in a good place if they are movable which in most instances is at the front or sides. Also, you need to arrange your tools properly in the pouches and pockets by ensuring that the sharp points are always facing down or the tools lay horizontal on the pocket if they can fit. An electrician tool belt should be straightforward to wear as you only need to wrap it around your waist and put on the straps if any before buckling it. However, it is important to make sure that you do it properly by ensuring that it is well balanced so that the weight is equal on both sides. A balanced tool belt will make it easy to climb ladders and prevent back and waist pain and bruises. As you use your tool belt, it is important to remember to check it regularly to ensure that all the tools are properly placed and that you did not drop anything. Because you will probably have sharp tools on the tool belt, regular checking will ensure that the sharp tools do not rip through the pocket or pouch and cause injuries. Another safety tip to know is that it is always better to wear a tool belt with suspenders. Suspenders can help prevent back problems as it will distribute the heavy weight of the belt more evenly to reduce strain. As an electrician, investing in a tool belt is one of the best decisions that you can make as it will make carrying tools around the work site easier and more convenient. Also, a tool belt can help prevent tool loss and ensure you do not always end up with back pains. However, as handy as they can be, they will only serve you well if you choose the best electrician tool belt from the many options in the market. But, with our buying guide above and top 7 reviews, finding your perfect electrician tool belt should now be super easy. And the good news is that you can be confident of ending up with a great-quality and highly durable tool belt regardless of what you choose from the 7 belts.